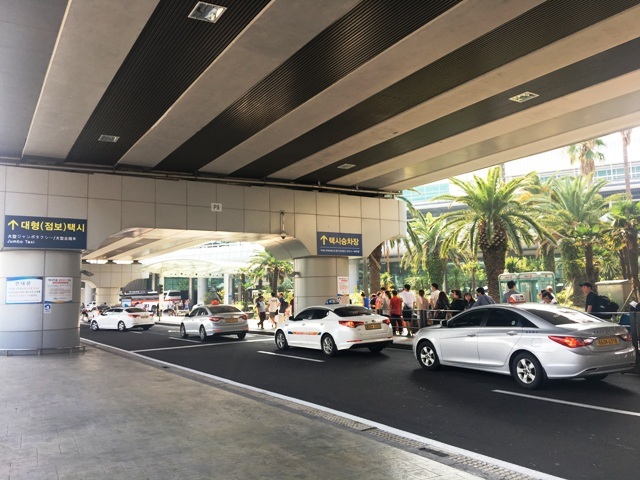 ▲ Taxis at Jeju International Airport. Photo courtesy The Jeju Weekly. From April 23, a discount will be introduced that gives an 800 won discount for transfers from a bus to a taxi. The discount applies for those who use a prepaid rechargeable transportation card. If you want to qualify for the discount, you should scan your transportation card as you leave the bus. You will then have to take a taxi within 40 minutes to qualify for the discount. Anyone with a transportation card can qualify for the discount whether tourist or resident. Some postpaid cards, however, will not work with the service. In order to reduce confusion about which cards will work, accepted cards will be advertised on the outside of the taxis. Previously, there were only discounts available for bus to bus transfers. Like with the bus to taxi transfer, you can transfer buses up to 40 minutes after you get off the bus. With bus transfers, however, instead of receiving a discount, the second bus is free. Last year, Jeju made some major changes to its bus system. These changes included setting the fair at 1,200 won for all buses (except express buses), simplifying the bus routes and numbers, and adding free wifi to all buses.